For some, it’s just another day on the Beach! When you are taking wedding photographs in public places you can’t expect to have the whole scenery just for yourself and at the Jersey Shore it’s no different. There’s a good chance that in many candid photographs there will be people in the background. But sometimes, like this photo in Spring Lake, thats a good thing! The little boy playing in the sand and running into the frame of the photo makes the image! I was walking backwards as the couple walked in my direction and at first the boy was off to the side. Then suddenly he decided it was time to make a run for it and just took off, shovel and all! As soon as I saw him do this I knew that I had to take the photo before he disappeared behind the couple. A fraction of a second later and it wouldn’t have been the same. We have many photos of just the couple, so having this extra one with that little boy is a big bonus. To me the image says, “Most important day in our lives AND just another day at the beach” all in the same frame. We had a little intruder show up! Let’s stay on the beach since we have more unexpected photo bombers making appearances. This wedding was at McLoone’s Pier House in Long Branch and the ceremony was just getting under way when a little beach goer just randomly wandered into the photo and decided to sit in the best seat in the house. 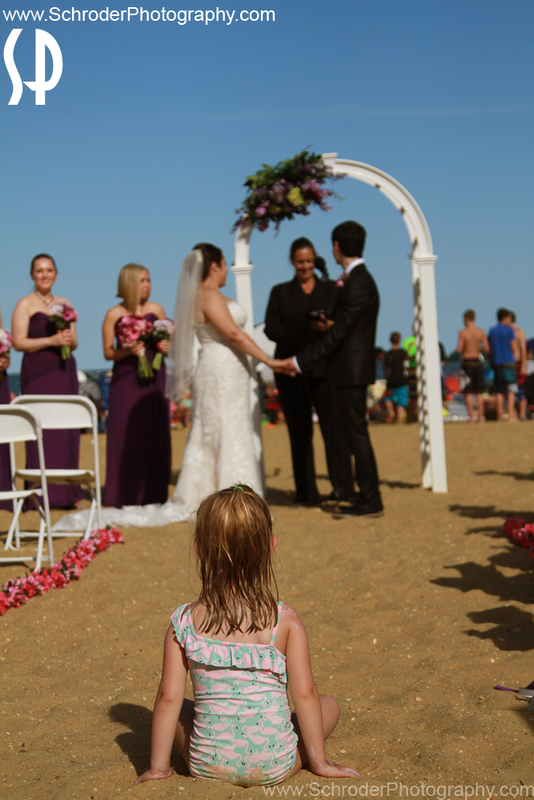 This little girl must have been marveled by the idea of a wedding taking place right there on the beach in front of her very own eyes! From the corner of my eye I saw her Mom quickly approaching and I knew the opportunity for this shot wouldn’t last. So I quickly took the shot. A couple seconds later Mom swept her up and took her away. Notice how one bridesmaid sees the girl. 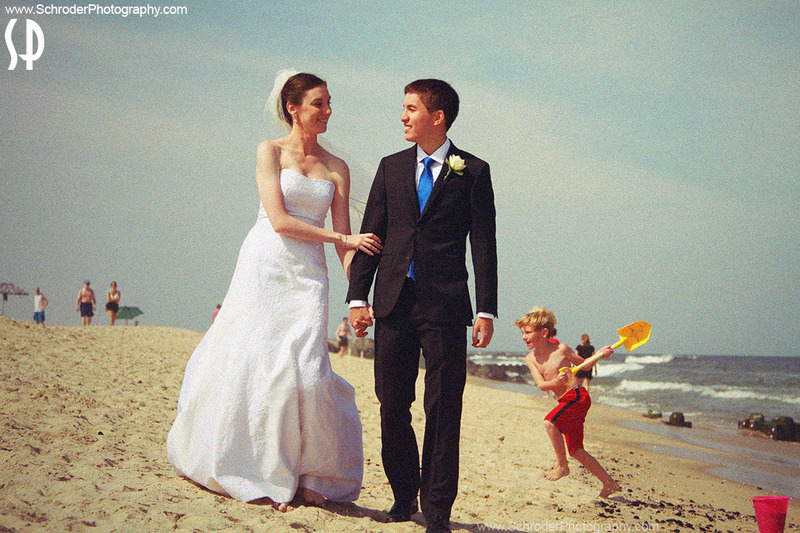 I don’t think the couple knew of this wedding crasher until they saw the photograph. Lets complete a beach trilogy here. 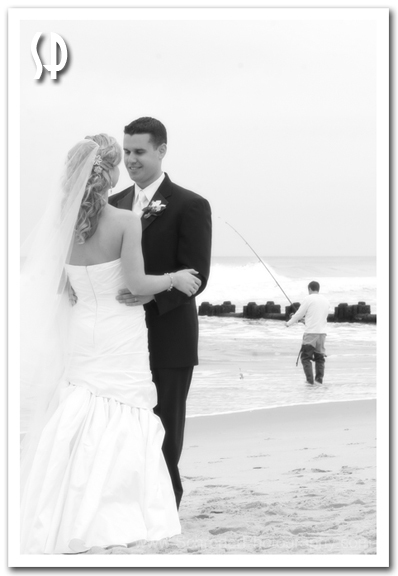 In this shot, also a Jersey Shore Wedding, the fisherman didn’t run into the frame. 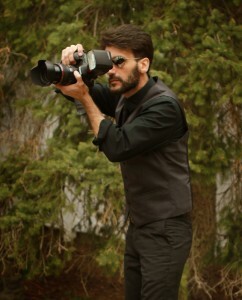 As a matter of fact I could have easily framed him out….and I did in other shots…. but I simply couldn’t pass on the opportunity to include him in one of the photographs. It’s not often you get a chance to show in a wedding photo just everyday activities contrasting that to the most important day in someones life, so when you get a chance you have to take that shot! Lesson to be learned here with these 3 photos…. you never know what you are going to get at a beach wedding and who might make a cameo apperance! Watch this ‘Behind the scenes’ video of the making of some film photographs by Louis Schroder at Weddings.